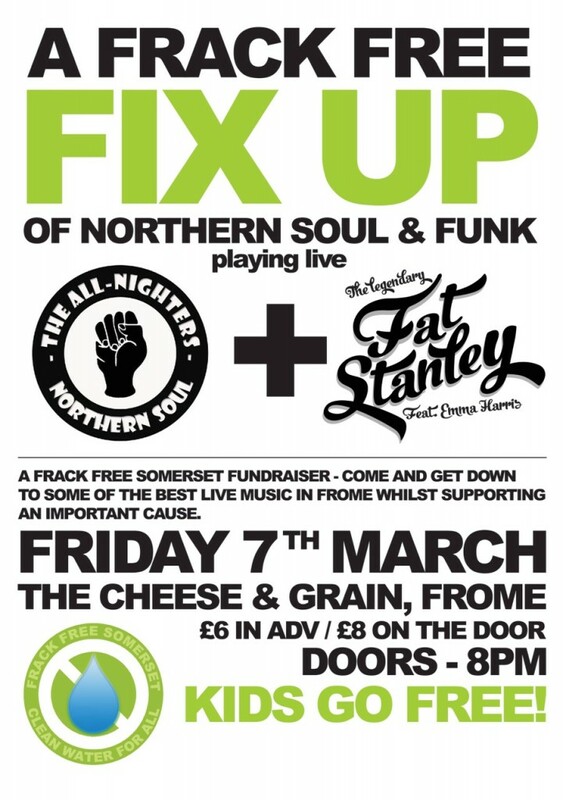 You’ll hopefully have seen the film, will have been to the jumble sale so now it’s time to ‘Get Down’ to the Cheese and Grain on Friday 7th of March and dance your support for Frack Free Somerset at a benefit party to end ‘Frack Free February’ – and maybe even fracking! With two live bands and two fantastic soul DJ’s (Mr Z and Mickey The Finn) to groove to, the evening’s entertainment is a bargain. Children go free and tickets, available from Raves from the Grave and the Cheese and Grain, cost but £6 in advance, or £8 on the door. The All-Nighters are an eight-piece Northern Soul with members from Frome, Trowbridge and Radstock. The band pays tribute to the classic up-tempo soul played in northern clubs in the late 1960′s and early 1970′s – authentically reproducing the feel of the era. Formed in February 2011, this will be The All-Nighters first Frome show. Fat Stanley are an 11 piece funk machine playing funk, soul & dance. Filled with local Frome characters the legendary Fat Stanley aren’t to be missed. Is INEOS planning to drill for shale gas in Sherwood Forest?